Molkuran is gifted with strong, metal teeth wrapped in a powerful jaw. 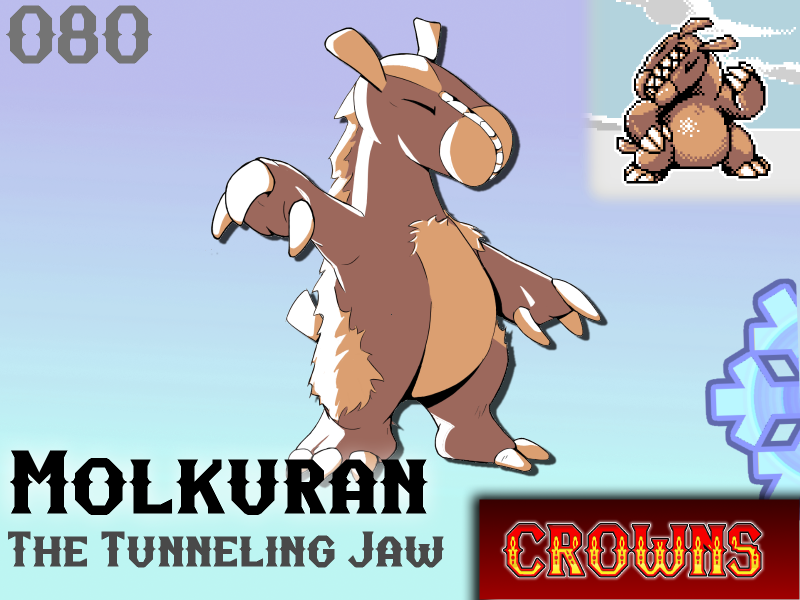 Molkuran's sideways mouth is used to crush rocks and carve deep tunnels into the bedrock and walls of the western caves it calls home. The powerful jaw and metal teeth excel at this task, designed not to pierce, but instead to apply a steady, building pressure until the rock snaps cleanly in two. Its tunneling is so prolific that many accredit the passage beneath Raptor Mountain that connects West and Central Crown Island to this diligent miner. This beast's diet consists of insects, mushrooms and the occasional blind fish found in the in which it dwells. While Molkuran does not naturally act as a predator, its tremendous body and jaw strength make it a serious threat to the intruding tamer. Will Molkuran make your team?